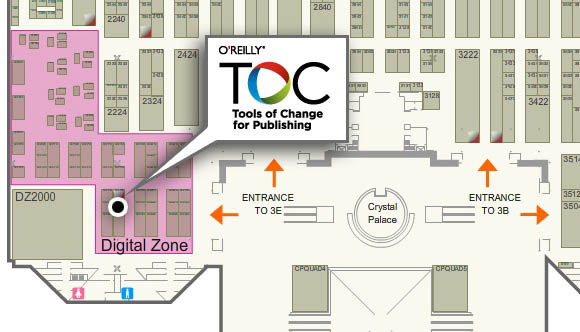 We'll be setting up shop in the Expo Hall's Digital Zone (booth #DZ2309) and we invite you to stop by and say hi. Joe, Kat, and Betsy will be working the booth, available to talk about the future of publishing or whatever else is on your mind. We'll also have free books and some other fun swag (animal stickers anyone?) to give away. If you'd like to set up a time to meet, send an email to kmeyer@oreilly.com and/or jwikert@oreilly.com and let us know what works for your schedule and we'll do our best to accommodate you. Ignite BEA - Enlighten Us, But Make it Quick! Each of these presenters will give a 5 minute talk, with slides that auto-advance every 15 seconds. The audience will judge winners via applause-o-meter. If you've been to an Ignite talk you know how entertaining this format is; if you haven't, you're in for a treat. Note: in order to attend Ignite BEA your pass must include access to IDPF's Digital Book Program. After Ignite you're invited to the BookRageous BEA Bash featuring some of our favorite authors -- hijinks guaranteed to ensue. The BookRageous team will also be doing a special raffle to raise money for Housing Works. We've asked Jami Attenberg, Kate Christensen, Jennifer Egan, Ben Greenman, Lev Grossman, Emma Straub, and Justin Taylor to make you a mixtape of a few of their favorite party songs. The mixes will be available on Spotify to one and all, but at the raffle you could actually win a mixed tape, filled out and signed by one of them -- because there is nothing more satisfying than an actual mixtape. We'll have some of our authors available for book signings on June 5 in the Expo Hall Autographing Area (table #27). Stop by to meet the authors and get a signed copy of their book.